Antonio Meloto, 62, has a background in Economics. 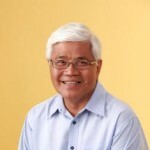 He is a former SVP at Procter & Gamble, then a Founder and Entrepreneur, before becoming the Founding President of the NGO "Gawad Kalinga" (= to Give Care) in 2003. For the past 15 years, he has devoted himself to the fight against extreme poverty in his home-country, with the aim to restore dignity to the 25 million poorest Filipinos by 2024 (5 million households in slums). His approach is to build empowered, sustainable, self-sufficient "Communities", accompanied by 7 development programs (including for education and health), and now, to significantly develop and scale-up social businesses.